Canadians continue to pile up massive amounts of debt, but so far they're managing to stay on top of it. That's one of the conclusions of a report published Thursday from credit monitoring TransUnion, which found the average debt load increased by 3.2 per cent this fall, compared to the same period a year ago. The typical Canadian now owes $21,686, TransUnion says — a figure that doesn't include the mortgage. 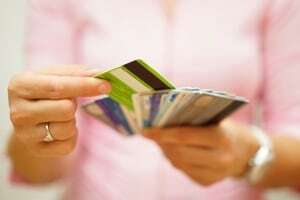 Within that figure, the average credit card debt is $3,954, a rise of two per cent this year. But the real growth has come in instalment loans — typically, short-term loans at much higher interest rates. Average balances on instalment loans have risen 6.8 per cent in the last year to $24,782 — a $2,200 increase from two years ago. "Canadians continued to add debt in the third quarter, with balances increasing across most loan types," said Jason Wang, Trans Union's director of research and analysis in Canada. "The recent government outlook of weak economic conditions may have led some consumers to believe low interest rates will be here for a long time, which could result in pushing balances even higher due to low expected borrowing costs." But while we are borrowing more, there's evidence to suggest that for the most part, we aren't being pulled under just yet. The number of people who are delinquent on their bills — which TransUnion says means they are more than 90 days behind on payments — is at 2.7 per cent. Last year, it was at 2.62 per cent. per cent in Alberta and 11.9 per cent in Saskatchewan. Everywhere else, the rate is either stable or falling. If current trends continue, the delinquency rate will improve to 2.63 per cent by the end of next year. "Delinquencies remain low on an overall basis, and that is a critical component for the larger Canadian credit picture," said Wang. "It's a sign that Canadians are largely able to manage their debts and make their payments on time every month. However, we will continue to monitor the trend for any potential signs consumers are having more difficulties managing their debt levels." The agency expects Canadians to borrow even more in the near term, though, forecasting that the average debt load could eclipse $22,000 per person by the end of next year. But another recent TransUnion study found many people aren't in a good position to stay on top of their debts. As many as one million Canadians wouldn't be able to handle an interest rate hike of even one percentage point.